Art and history at Lemon Grove Trolley Depot! – Cool San Diego Sights! 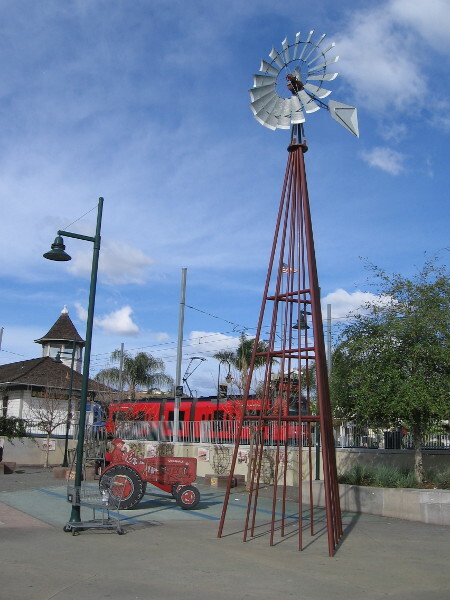 Art and history at Lemon Grove Trolley Depot! 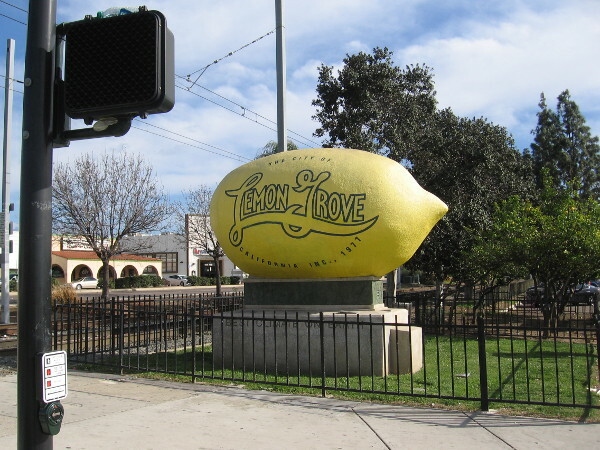 An enormous yellow lemon welcomes travelers passing through the heart of Lemon Grove, a community east of downtown San Diego. 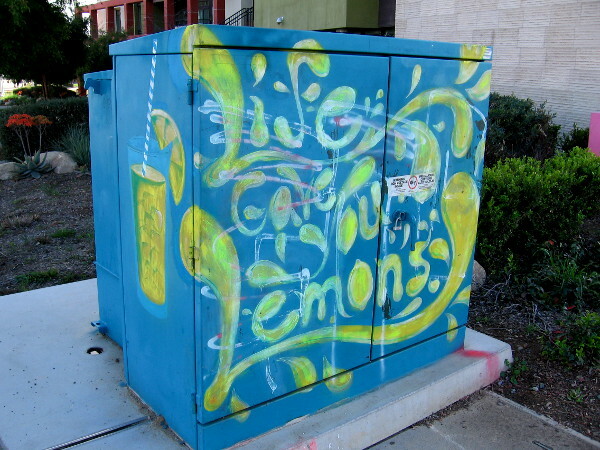 Step off an Orange Line trolley at the Lemon Grove Trolley Depot and you’re in for a surprise! 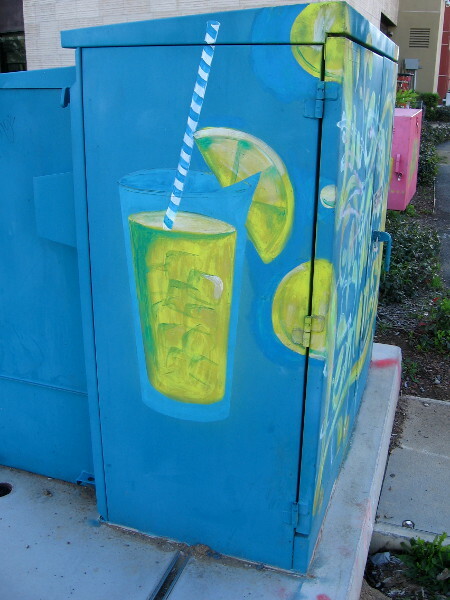 On either side of the trolley station are several fun installations of public art. 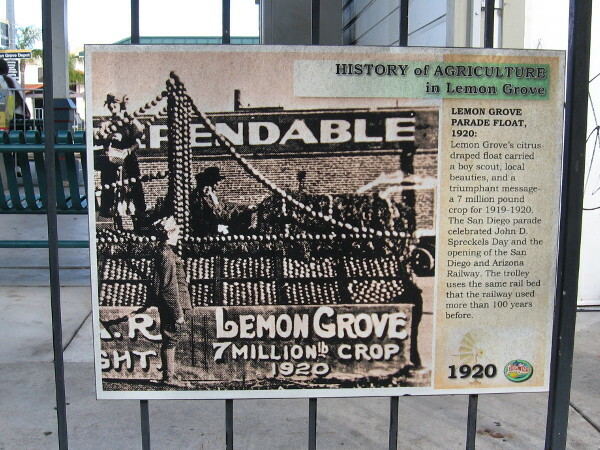 Signs also describe the unique agricultural history of Lemon Grove, which today is a sunny suburban community east of downtown San Diego. I cruised into the trolley station last weekend to explore the immediate area. 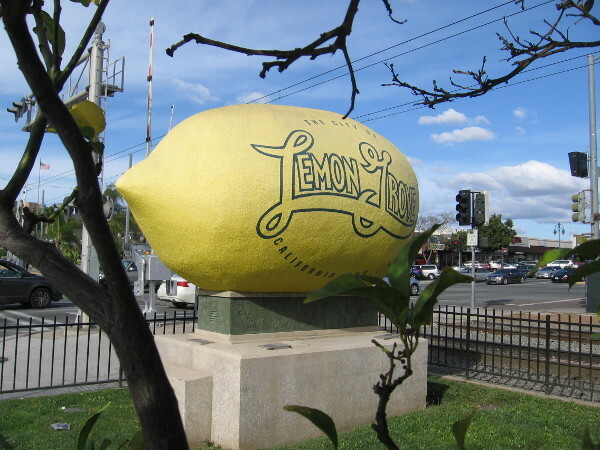 Of course, I had to direct my feet toward the big iconic lemon, which stands directly across the street from the depot, at the intersection of Broadway and Lemon Grove Avenue. The 3000 pound lemon was originally created in 1928 as a proud civic float for San Diego’s big Fourth of July parade. It was afterward turned into a permanent monument with a generous application of plaster! 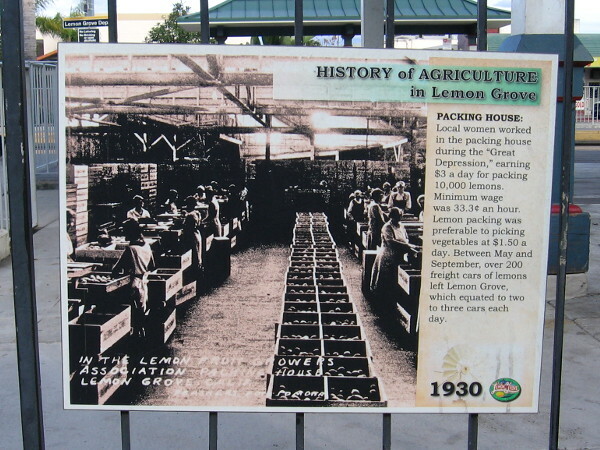 Read the photo captions to learn a little bit more about fascinating Lemon Grove! 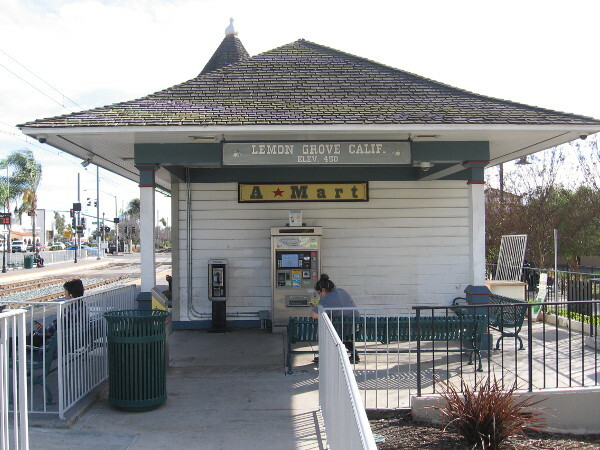 The Lemon Grove Trolley Depot is a 1986 replica of the original 1895 train depot, which stood near the Lemon Grove Store and a fruit-packing shed. 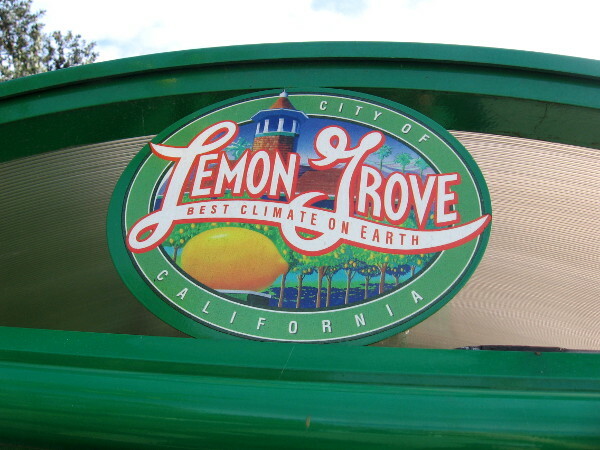 The city of Lemon Grove boasts the Best Climate on Earth! I spotted this sign at a nearby bus stop. 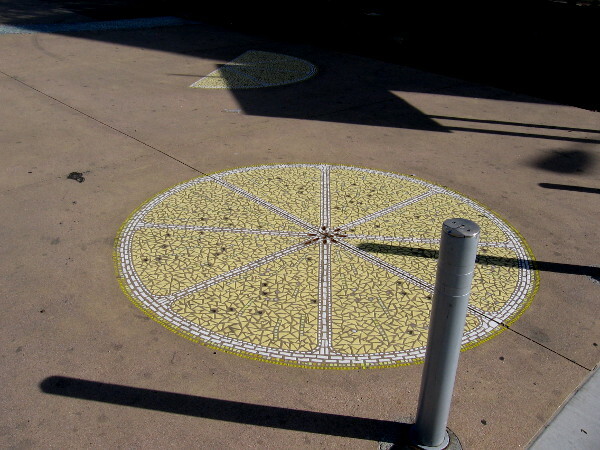 A walkway between the Celsius residential building and the Lemon Grove Trolley Depot contains tile mosaic lemon slices! 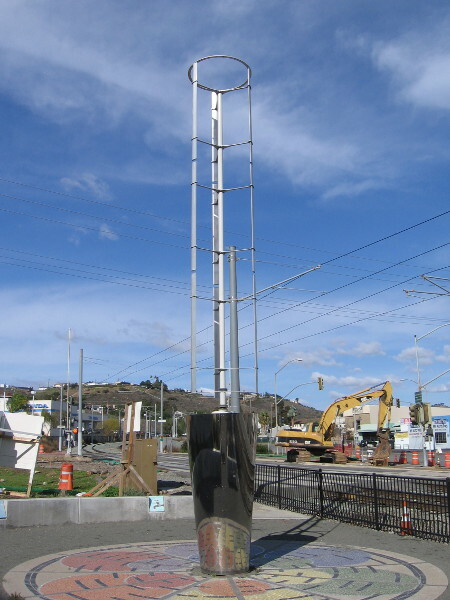 What appears to be a tall, shiny sculpture near Celsius and the trolley station rotates in the wind and generates electricity. 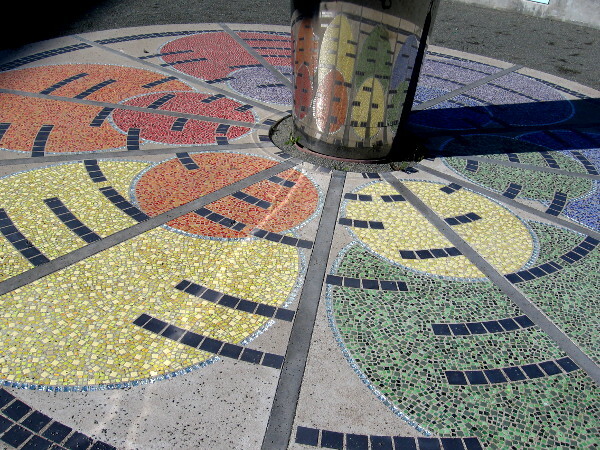 Colorful tiles radiate at the base of the rotating windmill. People wait for an Orange Line trolley at the Lemon Grove station. 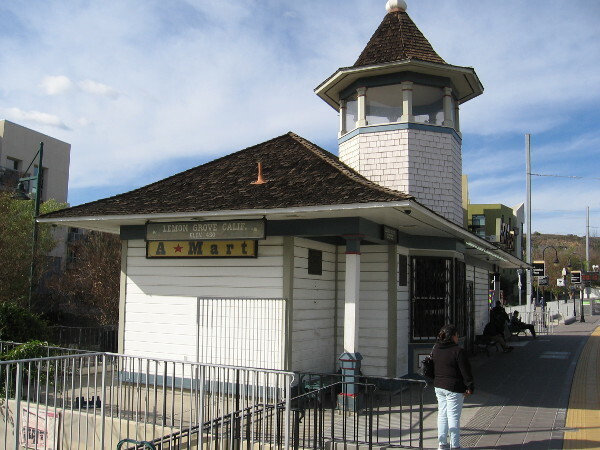 The original structure had an open cupola so the depot agent could wave signal flags at oncoming trains. A farm’s windmill and tractor are artistic reminders of an agricultural past. They stand in the promenade beside the Lemon Grove Trolley Depot. 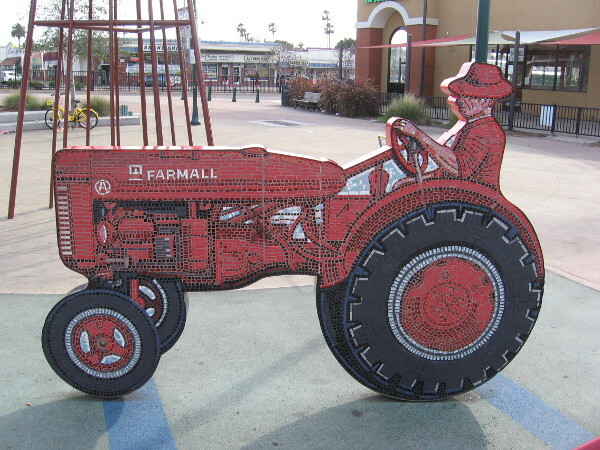 Both sides of this fun public art tractor are composed of small tiles. A creative bench in the public promenade. 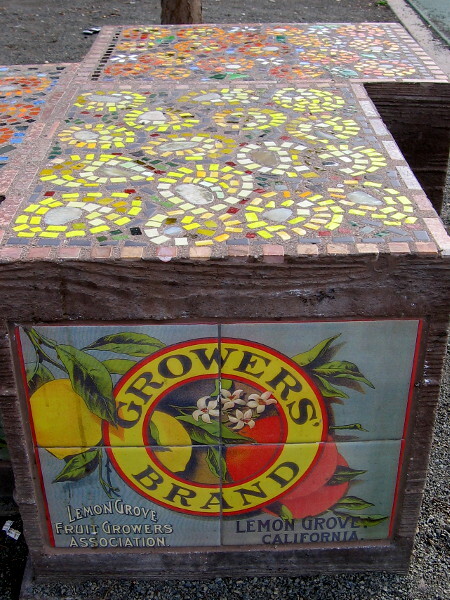 It appears like crates that were used by the Lemon Grove Fruit Growers Association! 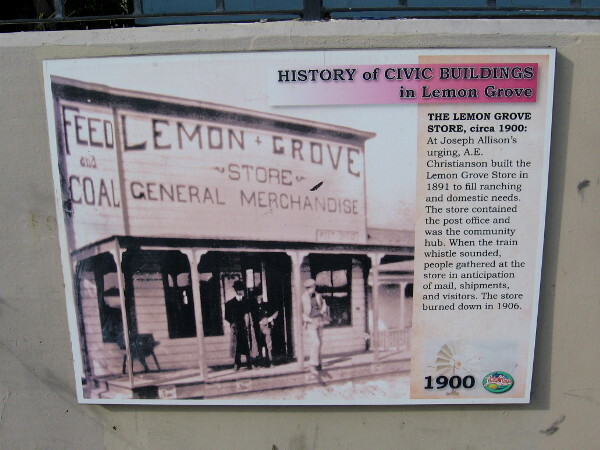 A sign near the depot shows the old Lemon Grove Store, circa 1900. The store provided supplies for nearby ranches, contained the post office, and was a community gathering place. 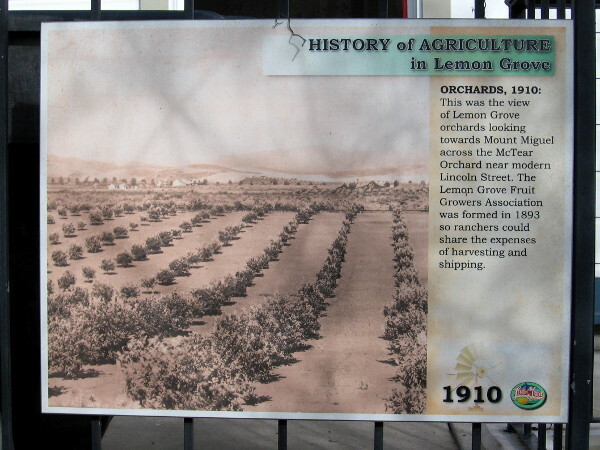 Another sign contains a view of Lemon Grove orchards looking towards Mount Miguel across the McTear Orchard in 1910. 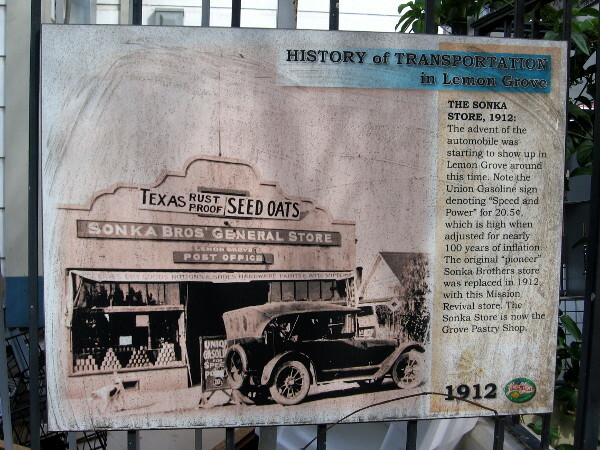 Old photo of the Sonka Store in 1912. 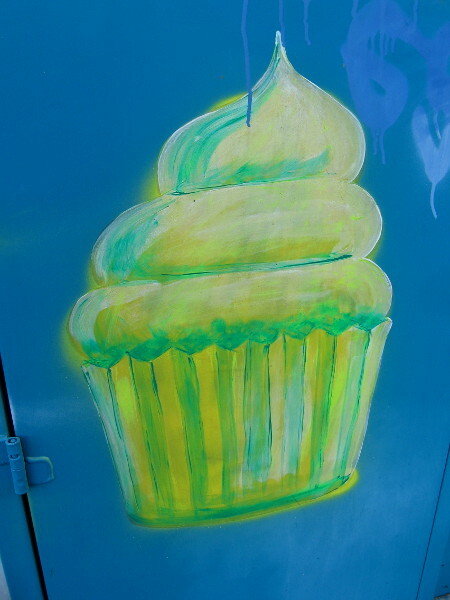 The building eventually became the Grove Pastry Shop. Old photo shows the Lemon Grove float during the San Diego parade in 1920. The parade celebrated the opening of John D. Spreckels’ railway, which existed where the trolley runs today. Another sign features a photo of local women working in the packing house during the Great Depression. During peak season, two or three railroad cars would be loaded full of lemons per day. The historical legacy of Lemon Grove is remembered around the site of the old train depot, which is now a stop of the San Diego Trolley. 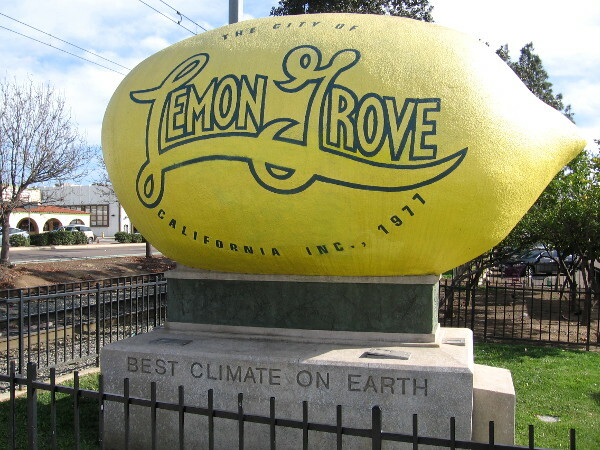 Lemons have a history of thriving in Lemon Grove, a community that claims to have the Best Climate on Earth! I’ve always driven by that giant lemon, but never stopped to see what else was there. Thanks for sharing – next time I’m in the area, I’ll stop and take a look around. Previous Previous post: Art from different colleges across San Diego. Next Next post: Photos from the 2017 Architectural Open House!